The only way to do this is to manage economic growth or degrowth by the adoption of an economic policy where development may not exceed ecological limits–precisely the definition of the steady state economy proposed by CASSE. However, in spite of initiatives by extraordinarily committed individuals, developments in ecological economics, and publications by Herman Daly and other members of CASSE, the traditional development process continues almost unchanged. This process fails to appropriately prioritize the social, economic, and environmental sectors to ensure that the growth of each does not occur at the expense of the others. 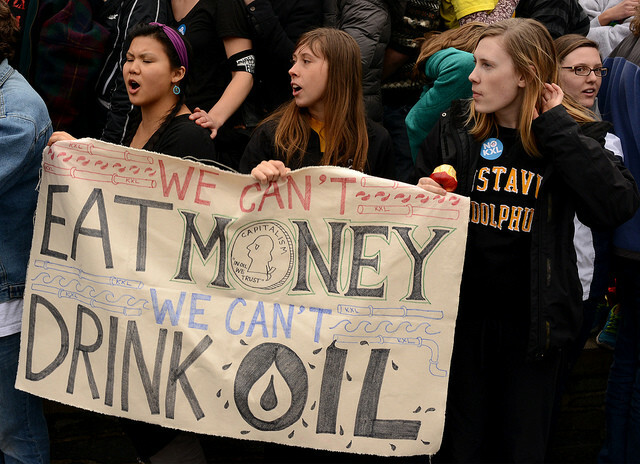 Consequently, the conflicts between economic growth and the environment continue unabated, improvements to quality-of-life are slow and unsustainable, and poverty continues to erode the advances that have been made. I believe one of the major reasons the concept of a steady state economy is not gaining traction is the omission of the role of fresh water in the production and maintenance of all its ecosystem and economic goods and services. The value of fresh water is that it sustains the life support system via the hydrological cycle. This cycle is the natural phenomenon whereby solar energy evaporates water from the surface of the planet to form clouds, and returns the water back to the planet’s surface in the form of rain, mist, and snow. 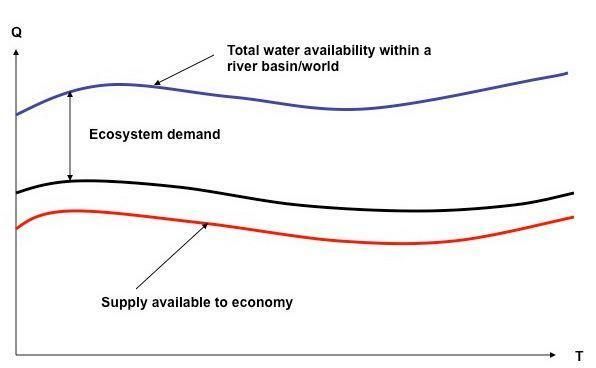 This diagram represents the availability of water in the economy and the environment. The quantity (Q) will vary over time (T) due to changes in the hydrological cycle, climate variations, and pollution. These variations in availability will always affect the scale of the economy and the ecosystem, because fresh water is required for every environmental and economic activity on this planet. To ensure a steady state economy, the supply of fresh water required to satisfy the ecosystem demand must be maintained at the expense of the economy’s demand for fresh water. Therefore, the scale of an economy and the services it produces are subservient to the availability of fresh water and the maintenance of the ecosystem services in its region. 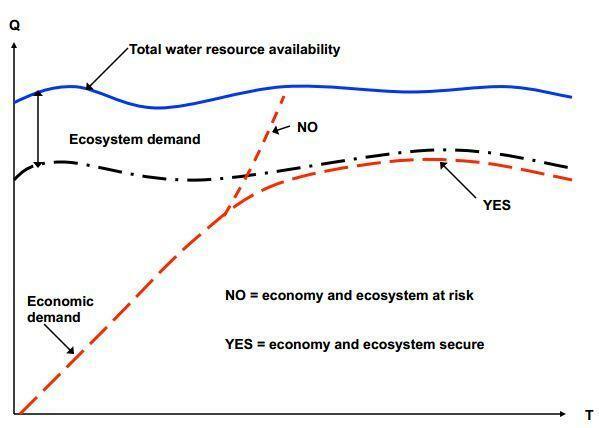 This means an economy can only grow within the dynamic hydrological envelope, and under the red supply line. As soon as its demand reaches the available supply, growth must stop, as in the below figure. Indeed, some planning committees have made explicit the understanding that economic scale is subservient to fresh water availability–for example, the Town of Okotoks, Alberta, Canada. In 2002, Okotoks designed a Water Management Plan based on the limits of the environmental carrying capacity of the Sheep River and its watershed, gross water consumption of about 300 liters per capita per day, and an urban development policy that provided no allowance for extending utility services outside the town’s municipal boundary. However, in 2013, after consulting the citizens of Okotoks, the town decided to pursue urban growth by annexing adjacent land, but not at the expense of the water required to satisfy the Sheep River ecosystem demand. 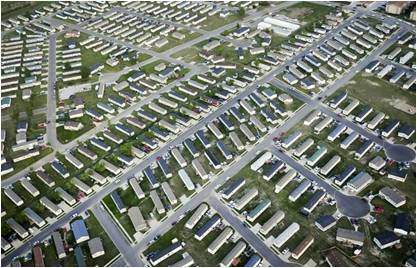 The present population of Okotoks is about 27,000, and the actual water supply will permit this population to grow until it reaches 35,000. Beyond this limit, additional water will be drawn from a regional water supply system via Calgary. 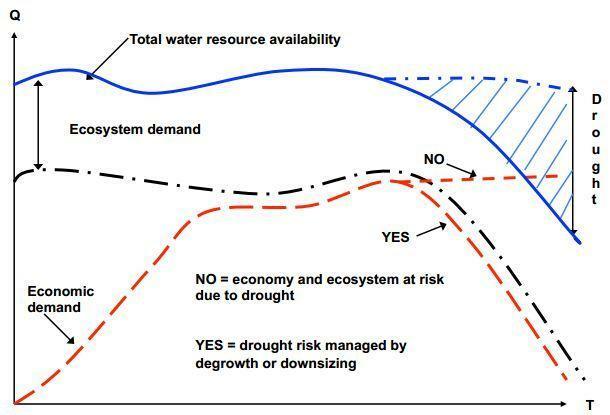 Conversely, in the case of a drought, when the hydrological envelope shrinks naturally, the economy must downsize or degrow, as in the below figure. No continent is immune to this natural phenomenon, and issues of food security often become the main concern. The degree of intensity and duration of droughts vary, so the amount of downsizing or degrowing will depend on the ability of the citizens and local/regional authorities to cope. Holistic water resources management and drought preparedness are key to the coping capacity of communities. There are no easy solutions because humanity cannot, and will never, control the behaviour of the hydrological cycle. So what does this mean in terms of a “full world”? To date, we are accustomed to talking about a finite planet and ecological footprints in terms of the number of planets needed to support us. Although correct, many people cannot easily sense the impact of the deterioration of the life support systems, the loss of biodiversity, and the depletion of renewable and non-renewable natural resources on his or her quality of life because the process is relatively slow. Compare this to the change in the supply of fresh water due to the behaviour of the climate or pollution. This is a daily topic of conversation because fresh water is vital, and people’s reactions in terms of quality of life, finance, effects on aquatic and terrestrial biodiversity, farming, industry, population carrying capacity, etc. are always immediate. In other words, they already know that “their world” is defined by the finite amount of water and quality of water in their region. As fresh water is an important “full world” parameter, I propose fresh water management be incorporated more fully into steady state policies and discussions with, for example, Integrated Water Resources Management (IWRM). IWRM, as defined by the Global Water Partnership, is a process that promotes the coordinated development and management of water, land, and related resources, in order to maximize the resultant economic and social welfare in an equitable manner without compromising the sustainability of vital ecosystems. The State should guarantee the preservation, conservation, protection, restoration, sustainable use and integrated management of watersheds, including necessary quality and quantity of ecological flows to sustain the integrity of all ecosystems associated with the hydrologic cycle, in order to safeguard the satisfaction of individual and collective human needs in function with societal health, including respecting the rights of nature and preserving biological diversity. 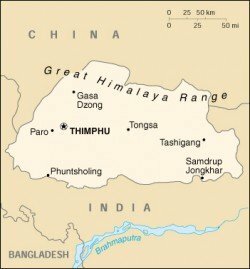 Population growth is being managed via free contraception, family planning, and education. As IWRM is designed to replace traditional top-down fragmented sector management with a bottom up cross-sector approach relying on cooperation, coordination, and population decrease, tangible results are not apparent at present. This will take time, perhaps a generation. While the dual policies of IWRM and population management have not been incorporated into a stated steady state economy objective, this is a very promising beginning. 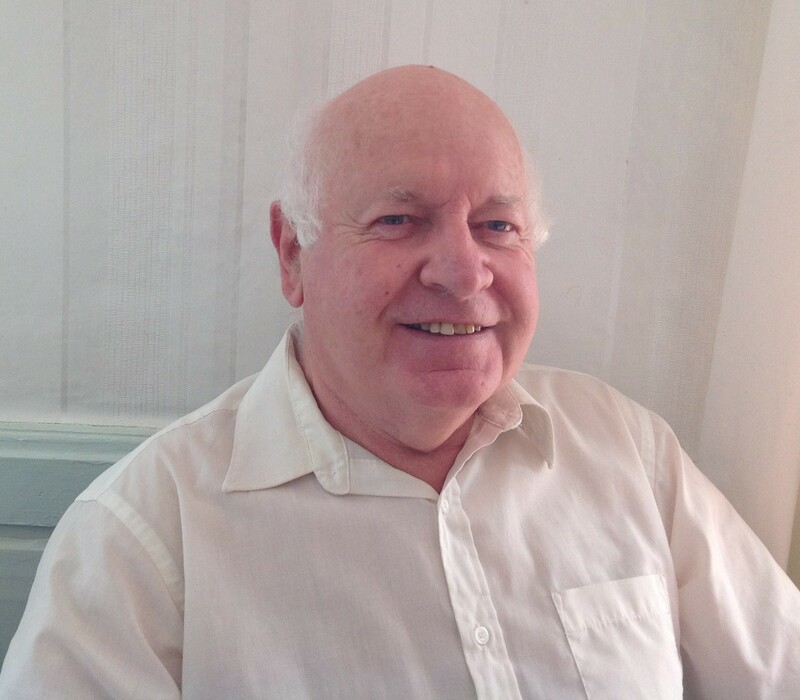 Geoffrey Matthews is a water engineer, now living in France. You lost me with the definition “a process of change which meets the needs of the present generation without compromising the ability of future generations to meet their own needs and aspirations”. There are so many problems with this definition I can’t begin to address them all in a brief comment. So I’ll just say this: no definition of sustainability that weasels away from the simple concepts of finitude of resources and limits on consumption is in any way honest.